The underwater world of the Bahamas resembles a National Geographic photo come to life. You can’t help but be awestruck by the vibrant hues of azure blue, the warmth of the currents, and the vastness of phenomena like the Lost Blue Hole. For a seasoned diver, it’s heaven, and for someone just stepping into the world of diving, it may seem a little scary. Trust us when we say that once you have the privilege of spending some time exploring the coral reefs that surround these pristine islands, the only thing you’ll be afraid of is not getting enough time in the water. The Bahamas may boast fabulous sunken wreck sites, and an enviable climate, its coral reefs and myriad reef fish are what make any dive, no matter how short, very special. 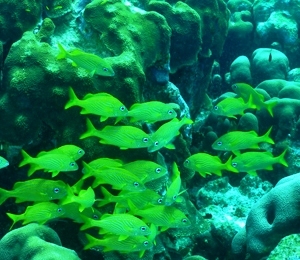 Bahamas reef fish are plentiful, and as varied as grains of sand on a sugary beach, which is way this blog is dedicated to providing a working guide to reef fish. Diving isn’t merely about throwing on a bunch of cumbersome equipment and jumping in, it is of utmost importance that you have a working knowledge of the species you’re swimming alongside. It’s important to remember that it is you intruding on their home, and not the other way around! 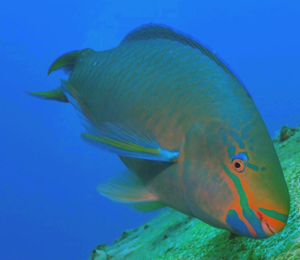 On this blog, we’ll be discussing various species of reef fish, what they like, what that they don’t like, when the best time to see them is, what they do for the underwater ecosystem as a whole, and how you can be a more responsible diver.